Last year #1 Son was the proud recipient of a speeding ticket. You should take care of that right away, I suggested. Don’t worry, Mom, I’ll take care of it. Later, #1 Son received a letter from the Oregon DMV explaining that the state frowns on people who fail to take care of their tickets and tends to suspend or revoke their driving privileges until it’s all cleared up. You really should take care of that, I reminded. Don’t worry, Mom, I’ll take care of it. Then #1 Son traveled to Brazil for over a month and life went on and I forgot all about it because… it had been taken care of. Tax time came, and taxes were calculated, and returns were electronically filed. #1 Son received a nice letter from the State Of Oregon (Revenue Division) thanking him for the tax return amount that had been applied to his outstanding account from Multnomah County. Would he please remit the remainder post haste? What’s this about? I asked. I don’t know, Mom. But don’t worry, I’ll get it taken care of. Fast forward to last Wednesday. It’s 10:30 PM, and I am drowsing knitting in front of the TV, watching a DVR’d episode of Men In Trees. The phone rings. #1 Son: Mom! My car just got towed! What am I going to do! I’ve been through this once before. Last year when I was in Miami on business, a call came from #1 Son in Canada asking me to move his car in Portland. It was difficult, since I was diagonally almost as far away across the US from the car as I could possibly get, thus my familiarity with the whole car towing thing. It also pointed out what a small place the world is becoming. But I digress. Mom (only 1/2 awake and trying to understand what might have happened): Why was your car towed? You have the area parking permit now. #1 Son: Well… OK… here’s what happened. You know how when you get off the freeway by my house you can only go north and I live south and everyone just does that illegal U-turn? Well… my roommate called to tell me that there were a lot of cops out pulling people over for illegal U-turns. So instead of making a U-turn I crossed two lanes over a solid white line and turned left. [ed. : because apparently an illegal left turn is so much better than an illegal U-turn.] And the cop pulled me over and towed my car. Mom (still trying to understand): Why did he tow your car? #1 Son (after long pause): Apparently I’ve been driving on a suspended license. But I really didn’t know that! And he threw me in the back of his car and frisked me and everything! He wouldn’t even let me push my car home even though I could see my house from where I was. What am I going to do? Mom (trying to remain calm): You will be glad you are not the kind of person to have illegal substances in your car (right?!?!?). You will be happy that you did take care of the lost registration so that this is not being complicated by a charge of driving a stolen vehicle (yes I know it’s not but you are a punk kid and therefore everything you say is suspect). In the morning you will call the state and find out what that outstanding debt is for and this time you will actually get it taken care of. You will then call the City Of Portland and find out how to get your car back. You will then call the court and find out how to take care of your ticket. You will then report back to me. Love you! #1 Son: Hi! I called the state and paid them. They will let Multnomah County know by tomorrow that I’ve paid and Multnomah County will tell DMV so that is taken care of. I called about my car… uh… apparently I have to get a release from the police first before I can get the car back. But I can’t get the release because I’m not the registered owner and I don’t have a valid driver’s license. uh… what do I do now? Mom: Apparently I will have to go get the release. Can one of your friends drive your car when I go to pick it up? By the way, your car is coming to my house. I will take your friend back to wherever they need to go afterwards. #1 Son: I talked to Guitar Hero and he can go. Here’s the number of the place where the car is. And here’s Guitar Hero’s number. And here’s the number and address of the place where you get the release. Thanks. I really love you! So I called Guitar Hero and asked him to be at my work front door at 4:00, and he agreed. 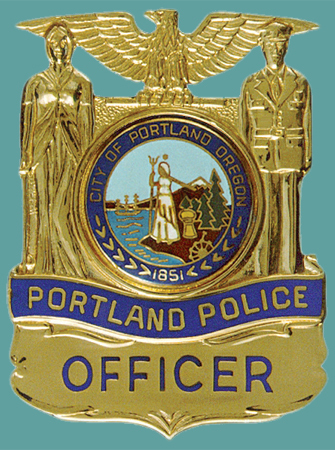 I called the Portland Police and learned that people trying to get back cars towed because of a crime have to go to the Asset Forfeiture Unit first. But I could go directly to the Records Division to obtain the release because this was for a violation not a crime. On my lunch hour (an extended hour, as it turns out), I walked down to the Portland Police Bureau Central Precinct. Once there, I was required to prove who I was and why I was there before I was allowed to ride the elevator up to the Records Division. The waiting room of the RD was tiny and lined on three sides with backless wooden benches. The east side included windows of bullet-proof (I assume) glass with little slits for papers and such to be passed back and forth. I stood briefly trying to get the lay of the land. Take a number, I was told. I did so and sat down against the north wall. The couple on the west bench were there to get a car that had been towed. (Do you see a pattern here?) They had been upstairs first to the Asset Forfeiture Unit. They didn’t really want to discuss why. I didn’t really want to know. The woman on the south bench across from me broke the pattern as she was just there to get a background check so she could rent an apartment. I really hope my drug convictions don’t show up, she said quite seriously. I had no idea how to respond to that except good luck. It occurred to me that I had left my knitting at work. Guitar Hero: uh… hi… you know when I talked to you earlier… there was something I sort of forgot… I think my license is unsuspended. I just need to go over to DMV to get it reinstated. But I sort of haven’t done that yet so it’s not really valid… I talked to Drummer Boy and he said he’ll go with you to get #1 Son’s car so I’m going to bring him down and we should be there pretty soon. Was I being punked? Twilight Zone? Candid Camera? (OK. That shows my age.) I was beginning to think that I was the last person in Oregon with a valid driver’s license. Drummer Boy went with me the last time I had to get #1 Son’s car out of hock. This, I told him is deja vu all over again. He assured me that he did, indeed, have a valid license. The tow company fortunately had a key, because I do not (which I remembered on the way over there). And #1 Son’s car is back outside my house, taking the place of the car that had taken the place of the truck. #1 Son: I think I forgot to tell you that L [ed. his girlfriend] is coming down from Canada and Autistic Youth is playing a couple of shows down in the Bay Area. We should be back I think on Sunday. Or maybe Monday. Mom: How are you getting down there? #1 Son (after long, long pause): Yeah. We’ll figure it out. Did you know that I could get my license back as soon as next Wednesday now that everything is taken care of but the new ticket? Isn’t that good news? Love you! We should try to be the parents of our future rather than the offspring of our past.